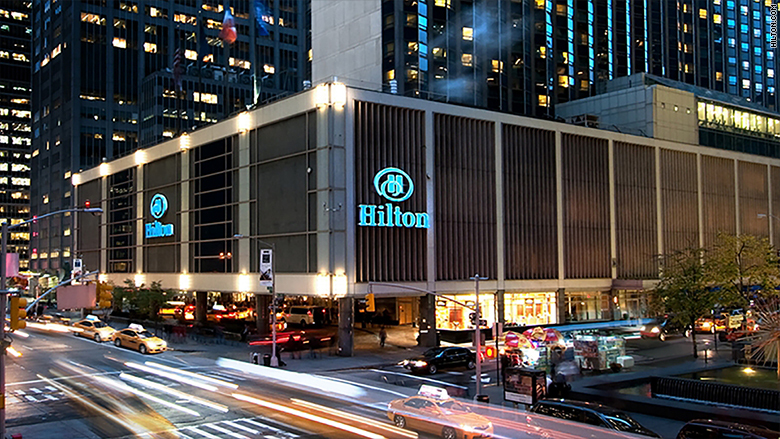 A huge Chinese conglomerate is checking out of Hilton. HNA Group, which borrowed heavily in recent years to buy up assets around the world, is now seeking to offload its roughly $6.5 billion stake in Hilton Worldwide (HLT), according to a regulatory filing Thursday. HNA is looking to sell "some or all" of its 26% stake in the storied American hotel chain, the filing said, noting that the timing of the sale would depend on market conditions. The news comes after HNA dumped its holdings in two other Hilton-related companies last month. If HNA manages to sell its Hilton Worldwide shares at or near market value, the Chinese company stands to walk away with a profit of more than $2 billion. The money could come in useful. HNA has been scrambling to sell assets in recent months to ease financial pressures at a time when Chinese authorities have cracked down on aggressive overseas spending by major companies. HNA started as a regional airline more than 20 years ago. In recent years, it went on a foreign spending binge, racking up an estimated $100 billion in debt in the process. Its empire includes the Radisson hotel chain and a 9% stake in Deutsche Bank (DB). HNA bought a roughly quarter stake in Hilton Worldwide for $6.5 billion in 2016. That investment turned into three different stakes when Hilton split itself into three publicly traded entities the following year. The Chinese company ended up with holdings in Hilton Worldwide, Hilton Grand Vacations (HGV) and Hilton Park Hotels & Resort (PK). Last month, HNA sold its stake in Hilton Grand Vacations for $1.1 billion and its stake in Park Hotels & Resort for just under $1.4 billion, according to regulatory filings. Other Chinese companies are also scaling back global ambitions under pressure from the country's government. Real estate and entertainment conglomerate Dalian Wanda Group has been dumping international properties and walking away from big Hollywood deals. And Anbang, an insurance firm whose portfolio includes the iconic Waldorf Astoria hotel, was recently taken over by the Chinese government. Authorities said this week they were injecting nearly $10 billion into the company to shore up its finances. Anbang's former chairman is on trial for fraud and embezzlement. -- Daniel Shane contributed to this report.